Good morning, and welcome to the last week of February. We're almost 1/6 the way through 2018! Time flies doesn't it? Let's dig in. My latest Harder Line column looks at tensions between the Trump administration and oil and gas industry. I'll preview that, and then hand the reins back to Ben to get you up to speed on the rest of the news. Trump should be great for oil and gas. He’s not. The oil and natural gas industry is running into a rough patch with President Trump. Why it matters: A Republican president who promotes American energy dominance should be good for oil and gas producers. But instead, conflict is escalating over trade, ethanol and offshore drilling. “Now that Trump has tax reform, he’s going to be doing things more unilaterally and the concern levels are starting to rise,” said Bob McNally, president of the consulting firm Rapidan Energy Group and former adviser to President George W. Bush. Trump is getting ready to likely impose tariffs on steel and aluminum imports. 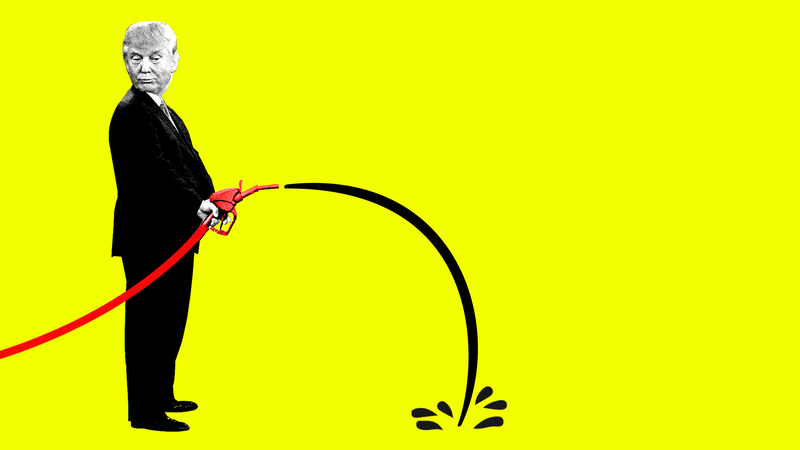 He's stuck between competing interests on the ethanol mandate. U.S.'s main oil and gas group and administration are at odds over offshore leasing. “This administration says it wants energy dominance, but its policies on trade and a number of other issues indicate otherwise,” said one oil industry official. Administration officials also privately complain about the industry’s handling of certain issues, like its lack of unity on ethanol and methane regulations, according to multiple industry and Trump officials. The big picture: The tension threatens to override Trump's positive rhetoric and regulatory rollbacks elsewhere in the administration. Today’s conflicts are more wide-ranging than last year’s main battleground: Energy Secretary Rick Perry’s failed plan to boost coal and nuclear power plant revenues in the name of grid resiliency. Gas producers opposed Perry’s proposal, fearing it would undercut their fuel’s advantage in power markets. Drill down for the rest in the Axios stream here. One big idea: natural resource lessons from "Black Panther"
Hoping life imitates art: Two Brookings Institution analysts say the acclaimed smash movie "Black Panther" offers lessons for how African countries can transform energy and mineral deposits into lasting public benefits. Why it matters: The movie is putting fresh attention on how to mitigate or avoid the "resource curse"— the poverty, conflict, and corruption in many resource-rich nations in Africa and elsewhere. Brookings' Mariama Sow and Amadou Sy look at management of the amazing metal vibranium in Wakanda, Black Panther's fictional African setting. "[T]he country has wisely made use of the metal to enhance technology and economic development for its people," they write, noting governance features including use of revenues for a social safety net. But they also suggest trading practices that could provide benefits beyond the isolationist Wakanda's borders. Two real places to watch: Exxon has found massive oil fields off Guyana's coast in South America, while automakers need increasing supplies of cobalt from the Democratic Republic of Congo for batteries for electric vehicle expansion. Yes, but: This Bloomberg Gadfly column, which also uses Black Panther as a hook, explores why Congo faces high hurdles to translating its cobalt bounty into a broader public good. Those hurdles are population size; longstanding civil conflict; the prospect that changes in battery tech will erode demand; and endemic corruption. Listen deeper: The latest International Monetary Fund podcast looks at a more recently recognized problem: the "presource curse" that can hinder economic growth in countries after petroleum discoveries but before any production occurs. The expectation of development can lead to poor spending and borrowing decisions that leave a country exposed if energy companies don't ultimately make big investment decisions. Screenshot: Bloomberg New Energy Finance comparison of evolving EV growth forecasts from different sources. The colors look cool: Bloomberg New Energy Finance has released a comparison of upward revisions in long-term EV projections from some of the big long-term global forecasts. It takes into account a major change last week from BP, which has bumped its 2035 projection to 190 million EVs on the road in 2035 (up from 100 million in last year's outlook), and issued a first-time 2040 forecast of 320 million. They're more optimistic about the degree and pace of battery price declines. BP sees "very dramatic" improvements in the efficiency of internal combustion engines. BNEF predicts gains there too, but McKerracher notes that they see "escalating costs of delivering these improvements driving more automakers toward adding plugs to their cars instead." "Ultimately though, we agree on more than we disagree. Like us, BP now expects some mass adoption of EVs and sees a growing role for sharing and autonomy," he writes. Speaking of EVs: The Financial Times has an in-depth weekend piece on the competition among automakers to secure supplies of lithium, cobalt and other raw materials for EV batteries. Quoted: “I think a lot of car manufacturers are almost panicking, in the sense they want to make sure they don’t miss out on the essential materials they need for the battery," Milan Thakore, a Wood Mackenzie analyst, tells the FT.
Out today: The nonprofit Alliance for Market Solutions released new polling on millennial attitudes about the reality of human-induced climate change and efforts to combat it. Millennials are broadly convinced human-induced climate change is real and deserves action, but millennial Republicans are relatively less concerned. By the numbers: Here's a few takeaways from the polling conducted for the Alliance, a group pushing for conservatives to embrace a revenue-neutral carbon tax married to repeal of regulations. Quoted: Alliance executive director Alex Flint said the findings show that policymakers should consider "forward-looking solutions." “Cutting outdated energy regulations that stifle growth and replacing them with a revenue-neutral carbon tax will help grow the economy and create a market for clean-energy technologies, allowing markets to lead on reducing carbon pollution instead of government," he said in a statement. ICYMI: President Trump told the Conservative Political Action Conference on Friday that "we've ended the war on beautiful, clean coal" and talked up conditions in West Virginia, Pennsylvania, Ohio and Wyoming. Coal jobs and production were falling for years under former President Obama, then had a brief upswing during his final months that continued for a while under Trump too, but have since reversed again in the most recent quarter. The recent changes are have little to do with the White House occupant and instead stem from factors like changes in global demand for metallurgical coal. A number of factors suggest coal will not make a major U.S. comeback, with nobody building new coal-fired power plants and old ones continuing to go out of service. Coal's structural decline in power markets blunt the impact of rules designed to spur mining and aid power generation. Bottom line: "Does coal have less to worry about from administration? Sure. Killing Stream Protection Rule, gumming up action on CO2, etc., slowed a decline in coal. But it’s done nothing to slow customers disappearing." Another look: "Coal has not come roaring back and West Virginia's economy, in particular, still struggles," the Associated Press reports. According to AP, coal mining has added 1,100 jobs in Trump's first year, reversing a half-decade of declines, and the industry now employs 51,800. But that's nearly 27,000 fewer than in 2013, they report. Trump reenters RFS fray: The president is slated to have lunch today with VP Mike Pence, EPA Administrator Scott Pruitt and Agriculture Secretary Sonny Perdue. On Tuesday, several senators will meet with Trump, Pruitt and Perdue about the topic. Changes to the Renewable Fuel Standard are on the menu for discussion. Independent refiners are looking to the administration to ease the costs of compliance credits known as Renewable Identification Numbers. The big question: Whether administration deliberations and brewing Capitol Hill legislation can actually end the forever wars over biofuels policy. "Significant progress has been made regarding a package of administrative reforms that could stabilize the RINs market while creating new opportunities for biofuels," a refining industry source tells Axios. Natural gas: A House Natural Resources panel will hear from executives with major LNG export companies and other experts at a hearing Tuesday on the growing U.S. role in global gas markets. Infrastructure: A House Energy and Commerce panel gathers Tuesday for a hearing on energy infrastructure. The witness list and GOP background memo is here. More infrastructure: The Senate Environment and Public Works Committee gathers Thursday to discuss the White House infrastructure plan, which seeks to speed up environmental reviews and permitting for pipelines and other energy projects. Cybersecurity: A Senate Energy and Natural Resources Committee hearing on Thursday will explore "private sector and government challenges and opportunities to promote the cybersecurity and resiliency of our nation’s critical energy infrastructure."